The Dunlap Institute’s annual, five-day summer school provides a unique introduction to cutting-edge astronomical instrumentation for current and future telescope facilities. The school is designed around both lecture and hands-on laboratory activities led by astronomers from around the world who specialize in the development of astronomical instruments. The program will introduce students to the basic principles of optics, spectrographs and detectors, as well as to advanced topics in instrument design and development. It includes a focus on laboratory, computer and data acquisition skills. Students also participate in career development sessions. 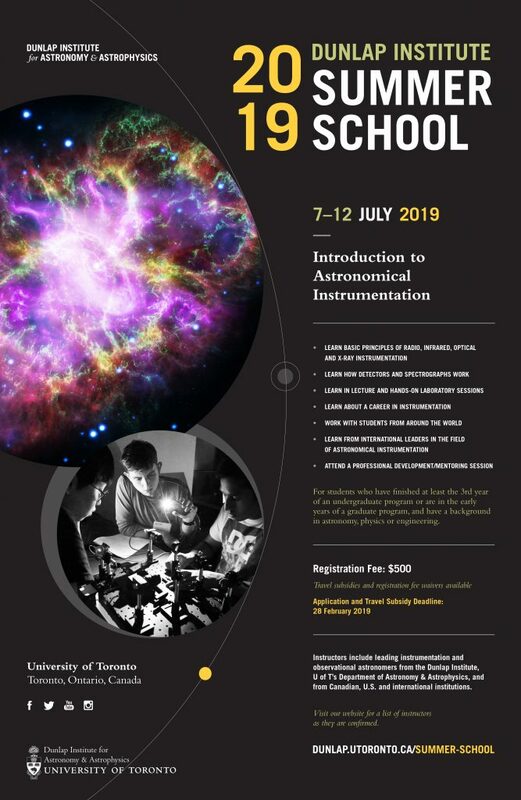 The summer school is aimed at students who have finished at least the third year of an undergraduate program or are in the early years of a graduate program, and have a background in astronomy, physics or engineering. The registration fee is $500. Travel subsidies and registration-fee waivers available. Students requesting a travel subsidy are asked to submit actual costs and not estimates; costs should be in Canadian dollars. While the Dunlap Institute is able to provide travel support to some students, we strongly encourage all students to explore sources of funding from their home institutes or countries. Many universities offer poorly advertised student travel support in the form of bursaries, grants or scholarships. This support is often available through a local Dean’s office, Faculty office, graduate student union or school of graduate studies. Every year, instructors include leading instrumentation and observational astronomers from the Dunlap Institute, U of T’s Department of Astronomy & Astrophysics (DAA), and from Canadian, U.S. and international institutions.